Miss Print: It's Giveaway Time - Terrain by Kate Spain! Hey there! What's up everyone? So, um, who's in the mood for a giveaway? 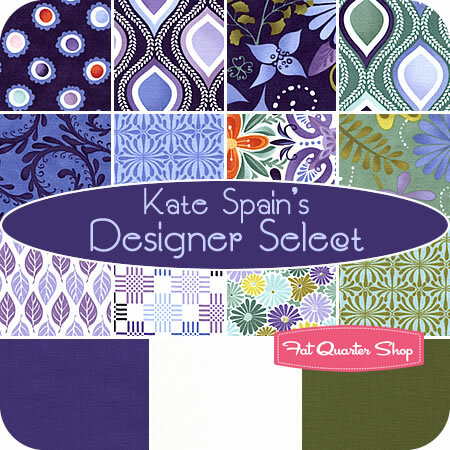 My lovely sponsor Fat Quarter Shop is offering up a Kate Spain Designer Select Bundle! Designer Select Bundles are exclusive to Fat Quarter Shop and comprise both prints and coordinating solids - you'll remember back in June I gave away a Tula Pink Designer Select Bundle when I first welcomed FQS as a sponsor. This exclusive bundle is made up of twelve prints from Kate Spain's just-released Terrain collection for Moda and three coordinating Bella Solids. Jennifer and I picked up and split an entire fat quarter bundle of Terrain at Quilt Market and let me tell you - it is absolutely gorgeous in person! Fat Quarter Shop's "Coming Soon" section you are most excited about. That's it - two easy, peasy chances to enter! I will close the comments in a week (on the 22nd) and announce the winner here on the blog. International entries are, as always, welcome! Wow! I love Terrain! I am a follower! Very excited for Adventures with Alice! I am excited by Lark! Oooh great giveaway Kaye! I'm really excited for Bespoken by Pat Bravo! All those purples!! I LOVE the Apple a Day!! I am a follower. Thanks for the opportunity. Thomas Knauer for Andover Fabrics! I am most looking forward to the Pezzy prints! I am waiting for Ruby. It is so beautiful. Thank you for the generous giveaway. Ruby, Pezzy, Finally Free, I forgot the name of Lotta Jansdotter's new line but that one too! Circa 1934 I wish I could just buy fabric every day! I'm a follower! Thank you for the chance to win! 'Lush Bespoken' by Pat Bravo - love love love this lady's work - beautiful fabric to feel and see! and its coming soon! Yippee! I'm a-following! Have for a while now, but it's official now! Cape Ann by Oliver + S looks so fun. I'd love to get some yardage of it for clothes for my girls and a quilt too. Thanks for the chance to win! Tahitian Crazy Daisey - yellow and black!! Love the Boys At Work line ~ perfect for my little guy! THANKS for the chance! I LOVE the Baltic Sea Batiks from Hoffman. I follow on Facebook AND on Windows Live. Thanks for the chance to win! I'm a follower of your blog and I so appreciate all that I learn from the bloggers. The giveaways are just the icing on the cake so thanks for the frosting! I like American Banner Rose! Thanks! There are so many! I think Circa 52 Organic Yardage looks irresistible. I'm a follower and I really enjoy your blog. Autumn Gathering really caught my eye. 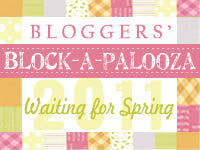 I like the Pat Sloan Bloggers Choice FQ kit. Love love love the *Fly a Kite* collection! I can't wait to see Ruby. Thanks for the chance to win! I am also a follower..... and I really enjoy your blog! The fly a kite line is adorable! I'm a loyal follower :) Thanks for the chance. Busytown on the Move-I loved the books as a kid and now read them to my daughter! I am a follower. Thanks for the giveaway. I like Always and Forever collection! Looking forward to Blueberry Crumb collection, perfect for a quilt for my cousin. I can't wait for Bespoken!! My favorite "coming soon"? Good Fortune by Kate Spain, of course!! I'm a follower and have been for quite sometime! I think it's the Fairy Tale Friends American Jane for Moda line that has my eye. Love the color combinations. Yes, I sure am a follower. Love your blog. Thanks for the give away chance. looking forward to Cira 1934. For some reason it's calling my name! I'm a follower and enjoy reading your blog! I like the looks of "Twirl" by Me & My Sister. Thanks for the great giveaway. Adventures With Alice is my fav coming soon. I love Lime Twist Emma! I like Amy Ellis' Blogger's Choice. I like Pink-A-Doodle or Bridal Shower (I think that's what it's called). Thanks for the opportunity to win! Adventures with Alice looks awesome!! This Little Black Duck waddles behind you each day, lol! My favorites are Butterscotch & Roses, and Adventures with Alice! Love them both, and just could not decide on one! ... and I'm a follower! "Boys at Work" is the one most likely to be coming soon to my house. I can't just pick one so I have to pick two. Always and Forever by Deb Strain and "oh my yes" Autumn Gatherings Jessie Aller. They are both just too too!!! I am a follower of your blog. Uhm Hmm yes I am. Thanks for a super giveaway!!! I am most looking forward to Vogue Blue Modernology by Pat Bravo in the Fat Quarter Shop Coming Soon section. I am excited for the Terrain QUilt kit featuring the jaybird pattern! Just got back from visiting Fat Quarter, and I am SO VERY EXCITED about the Richard Scarry Busytown on the Move! These were my favorite books when I was little! I'm most excited about Circe 1934! I can't wait to get my hands on that fabric! Looking forward to Central Park! I am a follower of your blog, it's great! Busytown on the Move - LOVE Richard Scarry! I love Etchings, I can't wait to get some yardage of it. I love the look of the new Echo fabric that's coming soon! I'm looking forward to buying Rouenneries Deux by french general, Good Fortune by kate spain and Reunion by sweetwater all available in January. I love Baltic Sea Batiks! Thanks for the gorgeous giveaway! I'm a follower of your blog. Thanks! Bespoken is my favorite among lots of the lovely designs that are coming soon. I have been a follower for a while now. Love your blog. I love the colors and style of Fairytale friends - or at least all of the coordinates! Been a follower for quite some time now. Thanks for the giveaway. Just love Kate Spain fabrics. I'm looking forward to Aviary! Yum! I'm a follower & love Terrain! Can't wait for Butterscotch & Roses -- Fat Quarter shop was the very first online shop I ever ordered from back when I started quilting. Thanks again! I think the new Echo line looks cool, but I am in love with Terrain!! For me it's a toss-up between the Lilac Rose batiks and Good Fortune. Busytown on the Move - I love Richard Scarry! I still remember Red Car, Green Car, Sport Limousine Car (OK, that probably really dates me). I love Butterscotch & Roses from Fig Tree Quilts for Moda Fabrics. I like how all the fabrics kind of go together no matter which line you've got stashed. I love Kate Spain . . . did you see her new line "Good Fortune" on that list of coming soon. Why do they tempt us so far in advance??? Thanks for the chance! Blueberry crumb cake! I love brown and blue together! Thanks so much! I love Crazy Daisy. I can imagine my kids wrap quilts making by these fabrics. Thank you for the giveaway. I am looking forward to the release of Butterscotch & Roses yardage. Can't wait to get my hands on a little bit of ruby! Tahks for the giveaway! "Good Fortune" (of course) and The Lorax are my most eagerly awaited lines at FQS. I've got notifications set up for both of them! I cant wait for the next collection by Kate Spain, Good fortune. Thanks for the giveaway. Oh, I love "Schoolhouse Alice Putnam"
I love the look of Fly a Kite! My boys would love Boys at Work too! I am a follower! Thanks for the chance to win this beautiful fabric! busytown on the move!!! i love anything by richard scarry. I am very excited about the Adventures with Alice fat quarter bundle. That would make a great nine patch quilt! Another wonderful giveaway - thanks Kaye! I'm waiting to hear whether your job interview was successful! Power pop by Janean Morrison! love the colors! Bespoken by Pat Bravo. I always seem to gravitate towards her fabric! I've been a follower for a while-- although I checked the "follow anonymously" box, so I guess I'm outing myself. akmajor (at) gmail (dot) com. Bespoken by Pat Bravo looks sooo lovely! I'm excited about Boys at Work line of fabrics - stuff for the guys is just hard to find! Love the Daisy Cottage fabric line...I've always loved pink and yellow together and now with grey as a neutral, they are really pretty! I am so looking forward to the Blush Pear Tree collection and Caroline's Collection. Terrain is fab! I'm currently using it to make a hexagon cushion, the colours are to die for! I really like the look of Walk in the Park by Kim Diehl for Henry Glass Fabrics. The colours are so deep and rich! I'm loving the Bespoken by Pat Bravo. Thanks for the giveaway! I'm a long time blog follower - enjoy your blog so much! I can't wait until Blueberry Crumb Cake comes out. I do love some blue and this would make an AWESOME quilt for my quest room done in yellow and blue. Yes ma'am, it sure would! Thank you for the chance at a most generous giveaway! I am most excited about Ruby by Bonnie and Camille. Should be here in October! oooh - so excited about aviary. Love love love the black and white prints. Thanks for the giveaway! I'm most looking forward to Kate Spain's next line: Good Fortune. I had been waiting for Kate Spain's new line and it's here! So I would have to say the next line on my wish list is Kate Spain's Good Fortune. Looking forward to Blueberry Plumcake!